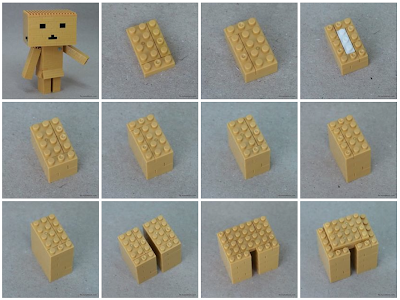 Click here for the nanoblock build instructions for Danbo Deluxe Edition. Danboard (or Danbo in short) is a fictional character from the comedy manga series Yotsuba&! by Kiyohiko Azuma, the creator of Azumanga Daioh. Danboard is a costume worn by Miura Hayasaka, a friend of Yotsuba's most frequent playmate, Ena Ayase. Ena does not have the heart to tell Yotsuba that Danboard is not a real robot, so Yotsuba thinks Danboard is real.